On Monday the new semester starts, and yet again: we will do a Sumo thing :-). They can choose which tool chain they would like to use to develop their application for the ARM Cortex-M0+ used from Freescale. One option is to create a ‘Do-It-Yourself’ toolchain. 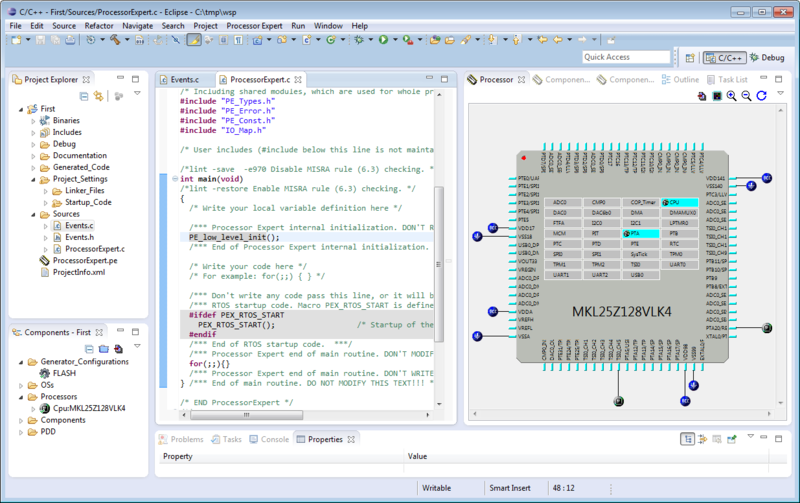 Since the start of the series, things have evolved: there is a new GNU ARM tool chain available, Segger has updated their drivers, and most important the GNU ARM Eclipse plugin has been greatly extended to support Freescale parts and Processor Expert. So instead to read through all the previous tutorials, this one is about putting together a free tool chain less than 10 minutes (not counting the time to download around 500 MByte). The steps outlined below get you a free and unlimited Eclipse toolchain installed on Windows. The setup outlined is for Segger J-Link/OpenSDA, but can be easily adapted for other run control solutions. Eclipse for C/C++: the IDE and framework to edit, build and debug my projects. Cross Build Tools: some tools like ‘echo’ or ‘rm’ are not present by default on Windows, this package closes that gap. GCC ARM Embedded: compiler, linker, build tools and gdb, they are needed to compile my sources. PATH: making sure that external tools are in the PATH. GNU ARM Eclipse plugins: integration of the GNU gcc for ARM into Eclipse, provides panels and build tool integration including a wizard to create new projects. Processor Expert: With Processor Expert I can build my applications with software drivers and have it deal with the low-level microcontroller initialization. McuOnEclipse Processor Expert Components: an extensive set of added Processor Expert components featured in this blog. Debug Interface: using the GDB debugger to deal with a probe like Segger. 💡 For deeper technical details, please go through the previous tutorials, listed at the end of this article. Then unzip the archive into your installation folder (I use C:\Freescale\Kepler). 💡 You can use the .zip from above site too. But then you need to change the PATH setting manually. 💡 Having the GNU Tools installed inside the Eclipse folder has advantages (everything in one place, easy to pass tool chains to somebody else, etc), but might not fit your needs. You still can change things later on. ❗ Make sure you select ‘Add path to environment variable’ at the end of the setup. The GNU ARM Embedded (gcc) tools. The Cross Build Tools: echo, make and rm. in my PATH settings. Verify with the DOS/cmd prompt and the ‘set path’ command if everything setup correctly. If not, go the to Windows Control Panel and change/modify the PATH environment variable (see here if you don’t know how to do this). as update site and install the packages. then switch to the Downloads tab. 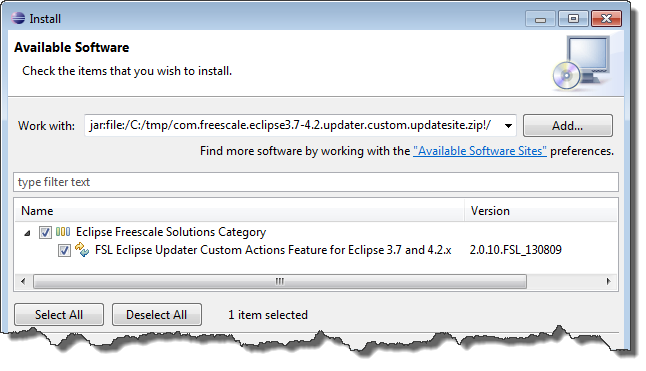 Download the ‘Microcontrollers Driver Suite plug-in for existing Eclipse’. 💡 Use ‘Add’ and then ‘Archive’ to browse for the zip file. Or drag&drop the file into the ‘Work with:’ field. Installation takes several minutes, followed by a restart of Eclipse. and download the PEUpd files (Part1 and Part2). In Eclipse, use the menu Processor Expert > Import Component(s) to import the two packages. Restart Eclipse. and download the software (you will need a serial number of a Segger probe). Then install the software (I have it installed under C:\Freescale\Kepler\SEGGER). 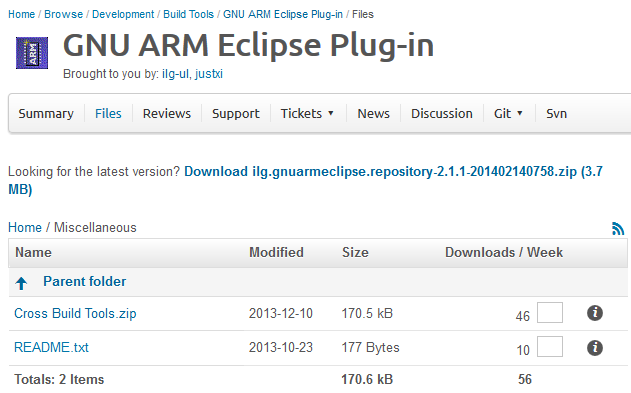 In the next post I explain how to create a project with the newly released GNU ARM Eclipse plugins. Stay tuned :-). This entry was posted in Building, Debugging, Eclipse, Embedded, Embedded Components, Kinetis, Processor Expert, Tips & Tricks and tagged arm gcc, Building, Debugging, Eclipse, Embedded Component, freedom board, FreeRTOS, Freescale, gnu gcc, KL25Z Freedom Board, open source projects, Processor Expert, software, technology, Tips&Tricks, tool chains by Erich Styger. Bookmark the permalink. Excellent summary, although I am the linux guy, this is enough for anyone to port over in linux. Just that building openOCD in linux is straightforward so i don’t use Segger, just the Freedom boards. Thanks! I still cannot build (yet?) OpenOCD with CMSIS-DAP on my machine, and I have not found any pre-built libraries. I started on this and wrote all the steps (using your steps as guideline), but somehow I still don’t have all the needed (or correct) build tools on my machine. Who could offer prebuilt Win32 binaries from the https://github.com/TheShed/OpenOCD-CMSIS-DAP? Issues were with the needed tools and dependencies. I had to stop working on it because of other priorities. Hey amazing. I was re-reading this as I’m trying to follow how to modify a component. So to modify a PEupd source file (since it is such a great teaching paradigm) I create a new component project “mcuoneclipseLocal” and from my fork of mcuoneclipse I copy the file Beans and Drivers on to the local project tree. However on opening KDS I can go into the project tree, but haven’t figured out how to invoke PE views. So I think I’m missing something and will have to go back to a previous tutorial to figure it out – or any suggestions. yes, many aspects fo this article seems to have ended up in KDS :-). With that DIY toolchain and Processor Expert (Driver Suite 10.4), it is possible to create components too, altough I still use and prefer the classic component wizards of CodeWarrior (easier and simpler to use). Where the components end up, depends on the IDE. For DS 10.4 and KDS it is PEXDRV_PE5_3, for CodeWarrior it is CWMCU_PE5_00, for classic S12X tools it is CW12_PE3_02. To open the Processor Expert views use Processor Expert > Show views. To import components from my library use File > Import > Component Development Environment. session context was:(profile=epp.package.cpp, phase=org.eclipse.equinox.internal.p2.engine.phases.Collect, operand=null –> [R]com.freescale.processorexpert.standalone_root 10.4.0, action=). It keeps failing at 79%, this is the error it spits out. Which Eclipse version are you using? Luna? Kepler? I see that you are trying to install 10.3: Driver Suite 10.4 is the latest one for Kepler, and Processor Expert for Kinetis v3.0 is the latest for Eclipse Luna. With a little luck I found that the Touchpoint error encountered in step 6 can be resolved by skipping the installation of PExDriverSuite_v10.3_eclipse.zip and downloading and installing PExDrv v10.4 Update 3 (requires base PExDrv v10.4 installed). The PExDrv v10.4 Update 3 update includes PExDriverSuite_v10.3_eclipse.zip. thanks for posting that solution. Yes, indeed, things are a little bit different with the 10.4. Glad to see that you made it working and posted the tip here! I’m spending more time getting the development environment working than the rest of the entire project will take and this has been the most helpful posting I’ve used, and I’ve tried many, so I felt it was appropriate to post the solution here. Glad I could help.